How my title of “Cat Lady” started… over twenty years ago, I was at a restaurant and while I was in the parking lot, I saw kittens playing with rocks in an adjacent parking lot. I watched their joyful, silliness for a while and knew in my heart, I had to help them. At this point in my life I had no idea what TNR (Trap-Neuter-Return) was. There were woods behind this establishment and I walked through them, noticing MANY cats and kittens living there. They appeared to be feral kitties. (A feral cat is the unsocialized offspring born to other ferals or from stray cats; these ferals are unaccustomed to human interaction. Feral cats are usually considered to be distinct from stray cats, which are socialized cats who no longer live in homes, but could potentially be reintroduced successfully.) I talked to the management of the business to get permission to help the kitties. (Which they were grateful for.) I set up a feeding station, as some of them were very thin. I decided the humane thing to do was to get them spayed and neutered. I thought how the heck am I going to get these wild cats in carriers AND is there a veterinarian that will even deal with this. This was before the Iowa Humane Alliance Regional Spay/Neuter Clinic was opened. I spoke to my vet and she was willing to work with me to get them spayed and neutered. So I did some research on humane traps and found a place that sold them in town. I purchased a couple and started on my quest to help these babies. Come to find out, there were about 32 cats and kittens residing in this location. I trapped about one or two cats/kittens a week until they were all done. I provided a couple of modified dog houses with straw in them for shelter and it was amazing how many would pack into one of them; it was like a clown car when I came to feed them. Slowly, but surely I got them spayed and neutered. I cared for that colony for over eight years every single day, until there were no more. That’s how TNR works; the colony population will slowly diminish over time. In my twenty-something years of doing TNR, I have provided countless ferals and strays food, shelter and love, but most importantly the gift of not bringing more babies into this world. I have found homes for many kittens and friendly cats that have showed up at my colonies. I help as many as I can. I currently care for four colonies, feeding daily and providing shelter and fixing any new comers that show up. 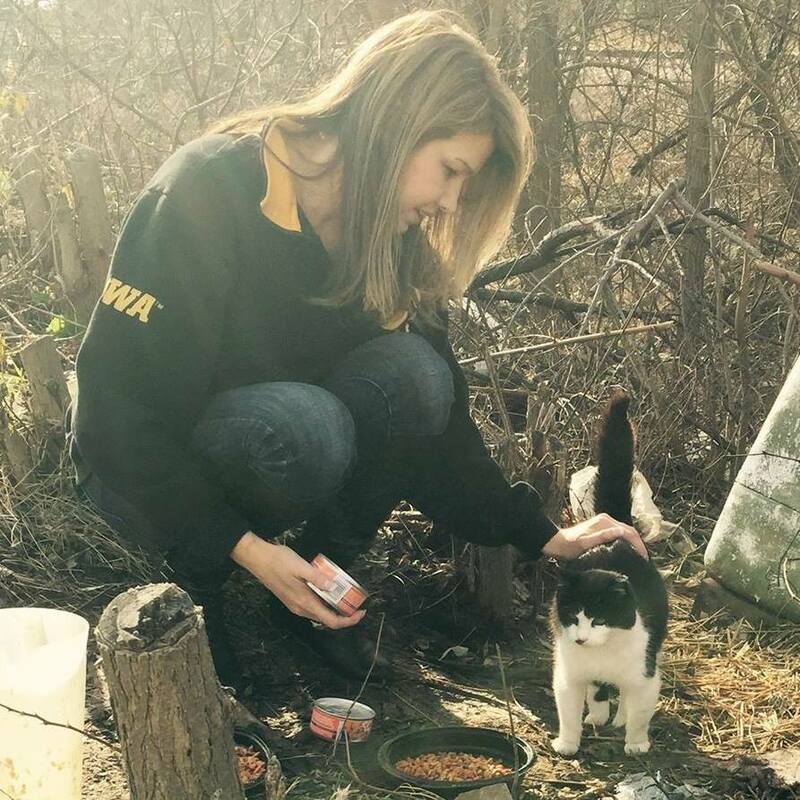 I am part of an amazing group called the Community Cat Team at Iowa Humane Alliance that hosts workshops to teach people about TNR. I am so grateful for, and love, the wonderful, amazing people who do this too, as well as my family and friends, who lift me up when I feel like I can’t do any more or have no more funds to help. It’s a never-ending job. Each and every animal that crosses my path takes a piece of my heart, and they in turn give me a piece of theirs. I cry at times, but am elated to know that I am making a difference, that I am saving lives and helping to end suffering. I am the “Cat Lady” and proud of it! !